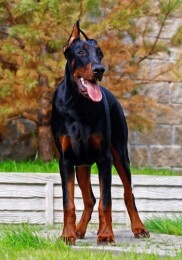 COLOR(S): Black, blue, red, and reddish brown, with tan markings. The Central Asian Ovtcharka is a very large, muscular, powerful, Mastiff type dog. It’s a loyal and fearless dog with the ability to protect flock and family. It is a calm, independent dog breed. It makes a good family pet. This is not a breed for the timid owner; it needs firm obedience training. The Central Asian Ovtcharka is good with all members of their own family; however, it should be supervised with children. It is highly recommended that this dog become fully obedience trained, requires an experienced owner. Early socialization is a must for the Central Asians. Outside the home it may try to dominate other dogs and is wary of strangers; it is a guardian and will act as such. It gets along with cats and other non-canine animals and other dogs, as long as the dog is not a threat to their charge. It likes to bark at night and this may present a problem if you have close neighbors. This dog breed lived its life with the Family of Turkmen thus it is a family dog that wants and seeks interaction with daily life. This flock guardian is not for everyone; it needs an owner who understands the flock guard type and the temperament that comes along with it. The Central Asian Ovtcharka breed may be prone to such health issues as hip dysplasia and bloat.